Around 1,000 dead ducks have been pulled from a river in southwest China, local officials say. Residents found the dead ducks in Nanhe river in Pengshan county, Sichuan province, and alerted the environmental department, they said. Local residents and livestock were not at risk as the river was not used for drinking water, officials added. 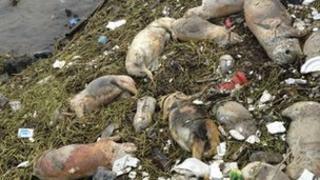 The news comes as the toll of dead pigs pulled from Shanghai's Huangpu river passed 16,000. Speaking in an interview with China National Radio on Sunday, Liang Weidong, a deputy director in Pengshan's publicity department, said that the authorities were first made aware of the ducks on Tuesday. Officials discovered over 50 woven bags which contained the carcasses of around 1,000 ducks in the river. They were unable to determine the cause of death as some of the ducks were already decomposed, Mr Liang said, adding that the bodies had been disinfected and buried. An initial investigation suggested that the duck corpses had originated from upstream and were not dumped by local Pengshan farmers, he said. The news has prompted concern and criticism from some users on weibo, China's version of Twitter, with many expressing incredulity at the government's assurance that the water is safe. "Dead pigs, dead ducks... this soup is getting thicker and thicker," wrote one person with the username Baby Lucky. "The dead pigs haven't even disappeared yet, and now the dead ducks emerge - does this society enjoy being competitive?" wrote netizen sugarandsweet. "The dead ducks in Pengshan river present us with a very practical problem, and show how society's bottom line is getting lower and lower," weibo user If So said. The news came as Shanghai's municipal government confirmed that over 16,000 pigs corpses had been pulled from Huangpu river, which supplies drinking water to Shanghai. The work of fishing out the dead pigs in the river was "basically finished", the government said in a statement released on Sunday. Workers have been pulling dead pigs from Huangpu river for the past two weeks, sparking concern amongst residents and on China's microblogs. It is still not clear where the dead pigs came from.